PHOENIX, Arizona, July 25. PART three of our look back at previous venues for swimming events at the Olympics looks at five extraordinary pools, two of which still hold major championship events. 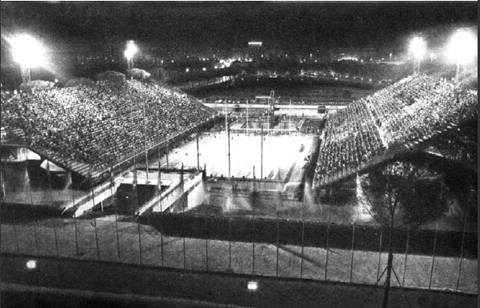 Let's start this installment with the 1960 Olympics in Rome, which featured the outdoor Stadio Olimpico del Nuoto, a large arena that had seating for 20,000 fans, thanks to a last-minute addition of temporary seating. Construction of the pool featured some new features that are now common in most pools. Wiring was fed into the starting blocks in Rome to allow all athletes to hear the starter's commands clearly. 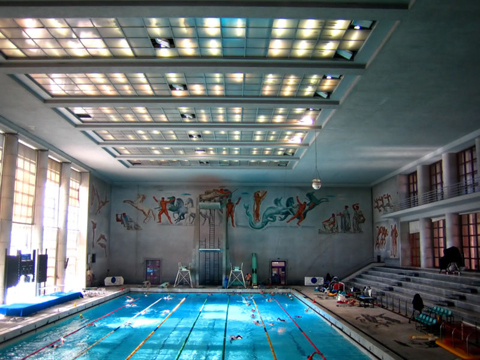 Underwater lighting made it easier for swimmers to see during nighttime swimming and glass panels allowed for underwater viewing. The pool has become infamous since the 1960 Olympics, hosting the two most controversial swimming world championships in history. At the 1994 edition, the Chinese women nearly swept the medals among speculation that they were doping, a rumor later to be confirmed. In 2009, rubber bodysuits were a major reason why 43 world records were broken during the eight-day meet. Those suits were banned a few months later. The look of the pool has not changed much in 42 years. The indoor pool has become a very popular place for Romans, especially in the winter months. The tiles on the walls and on the deck have interesting pictographs on them. 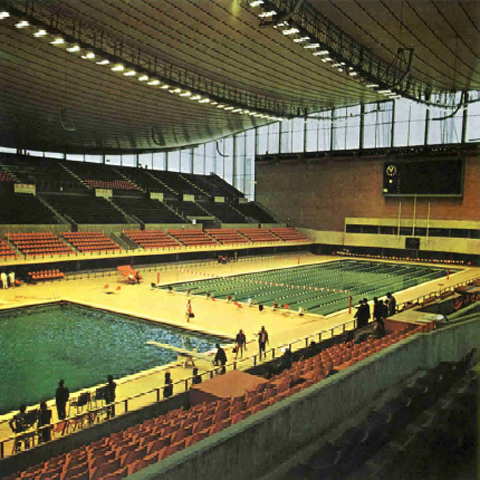 The first Olympics hosted in Asia featured a radical change in the way pool venues were built for the Olympics, and would inspire future architects to think outside the box for the Olympics. Inspired by Rome's Colosseum and Yale University's hockey arena, Kenzo Tange designed a facility that featured a suspension roof that blended Western architecture with Japanese aesthetics. 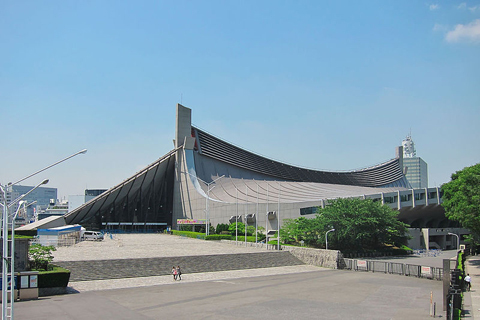 The Yoyogi National Gymnasium was the site of aquatic events, as well as basketball, which was held in a separate part of the arena. 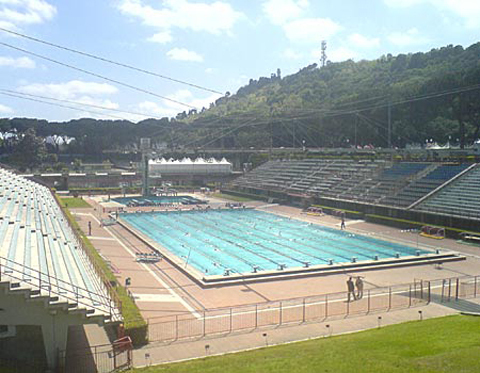 (Photo courtesy Wikipedia) Inside, the pool did not differ much from previous Olympic pools, except the width was 2 meters wider. The plan since inception was to make the facility into a multi-sport arena, and that continues to hold true today. The swimming pool has been replaced by an ice hockey rink, and basketball games are still played in the building. Many times, the arena is converted for music concerts. The pool was named after Francisco Marquez, a 13-year-old soldier in the Battle of Chapultepec, during the Mexican–American War in 1843. His story has made him a hero in Mexican folklore, and the building that bore his name created many swimming heroes, from Mark Spitz and Debbie Meyer, to Mike Burton and Felipe Mu?oz. Borrowing a page from Kenzo Tange's design of the Tokyo swimming venue, the facility in Mexico City featured a hanging roof design supported by cables and beams on either side of the roof that gave the ceiling a wavelike look. The pool fell into disrepair after the Olympics, but in 2009 it was re-opened by Mexican President Felipe Calderon in an attempt to get more Mexicans involved in exercise. 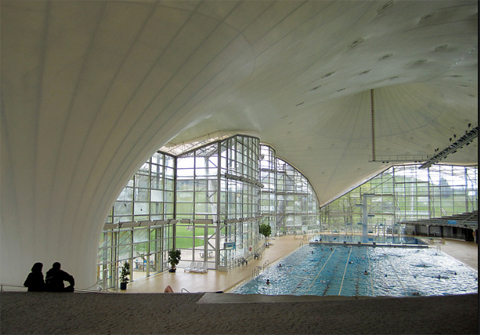 The suspension roof design remained, as did much of the original pool design. 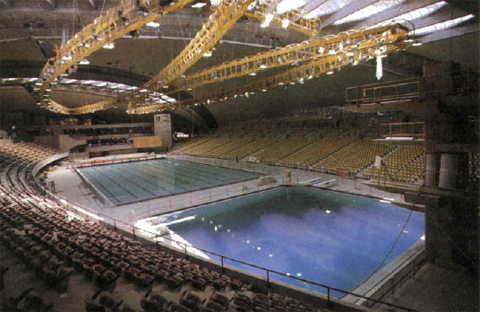 Many of the original seats were removed, as the pool was not meant to host any major competitions, and the facility is now a public recreation pool. The Germans wanted to host the swimming competition at its famed Dante Outdoor Pool, which had been around for about 70 years. To be sure, the choice of venue was not only an attempt to save money on constructing a new facility, but also because the pool was very close to the planned location of the Olympic Park. FINA, the governing body that oversees the swimming competition at the Olympics, had a rule in place at the time that Olympic swimming competition must be held indoors, so Munich had no choice but to enclose the Dante Outdoor Pool, and rename it the Olympia Schwimhalle (Olympic Swimming Hall). For the third consecutive Olympics, the roof's design of the swimming venue was the highlight of construction, featuring a lightweight steel-framed double-wave design supported by tension wires. 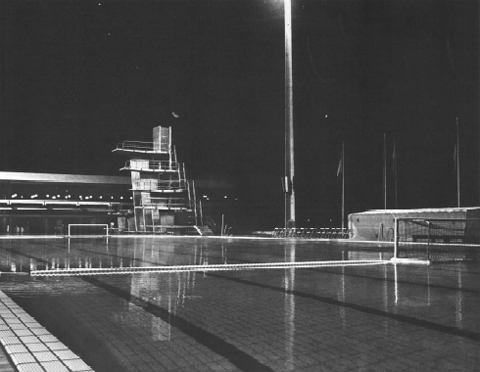 Two of the four walls featured partial glass facades instead of concrete, which ran along the length of the pool opposite the spectator side and along the wall behind the scoreboard. The pool was very deep, a large contributing factor in the 20 world records set at the meet, as well as the seven gold medals won by Mark Spitz. Where Mexico City's pool was only 6 feet deep, Munich's pool was more than 8 feet deep (2.5 meters to be exact). The pool is still widely used today, and featured a major remodel after the Olympics. In addition to removing the temporary spectator seating (down from 9,200 to 1,500), the glass fa?ade on the two walls was increased to rise from floor to ceiling. The warm-down pool is now a teaching pool. 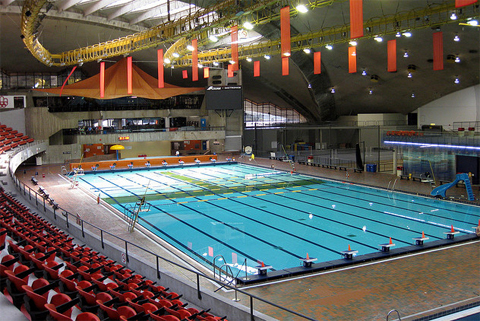 The Montreal Olympic Pool was part of the main Olympic Park, located next to the Olympic Stadium and underneath the base of the famed Tower. The Tower was not fully complete in time for the Games, but was completed about a year later. 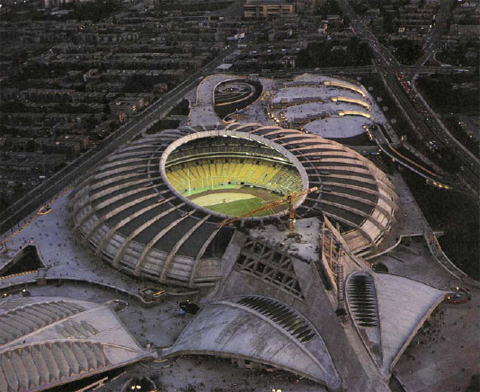 Previous Olympic pools have been housed next to the main Olympic Stadium, but this was the first time the pool and stadium were part of the same design and essentially connected to one another. 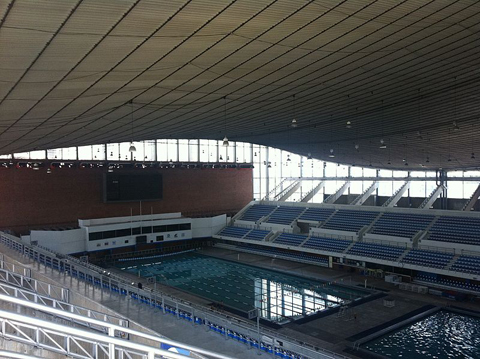 The pool, like the Olympic Stadium, was designed by Roger Taillibert. Only a wall of concrete separated the Olympic Stadium from the Olympic pool. (This was later replaced by a partial wall of glass.) Montreal featured the first 10-lane Olympic pool, keeping the two outer lanes empty during competition to keep athletes from racing next to the wall, where waves crashed against the wall and created turbulence. This was also the first Olympic pool to feature gutters that worked to keep the waves from returning to the pool, a feature that is common in almost every top-level pool in the world today. Today, the pool has not changed much, though there are those weird stripes running width-wise at the 25-meter mark and between the middle lanes for only 25 meters. Up next: The history of the Olympic pools in Moscow, Seoul, Barcelona and Atlanta.